← Upcycling ideas: flower pots out of baby shoes and plastic bottles. I love to repurpose things and decoupage provides me with the easy way of doing so. 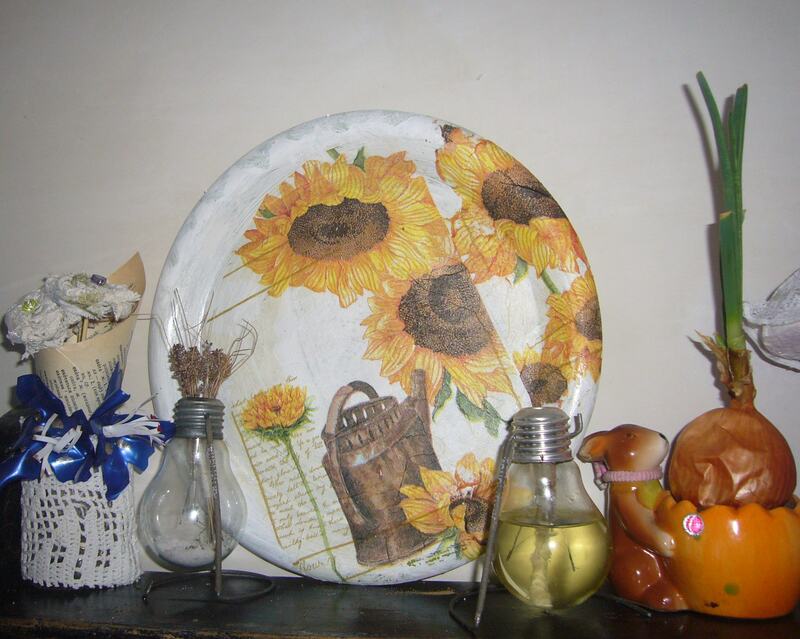 In this post you’ll see two decoupage ideas: decoupage on trays and recycled tile. I got two plastic and ugly green color trays at the flea market just for 50 cents. But they are perfect for decoupage. 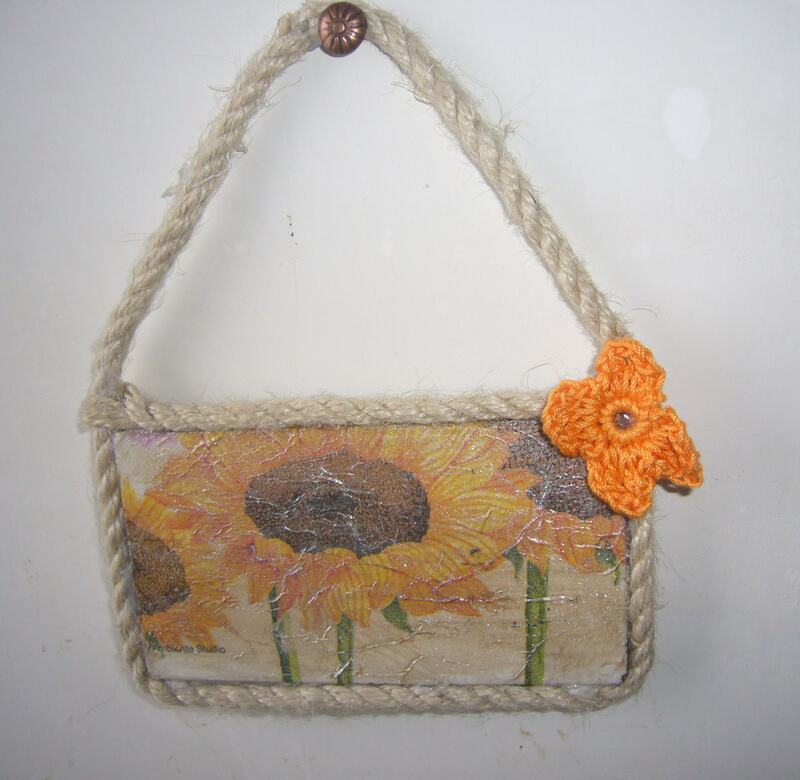 This one I have decoupaged with sunflowers. I can use it for serving food or carrying plates, but I love it on the shelf, too. It’s the same type of tray as the first one and I decoupaged it as a spring gift for one lady. It’s a sort of shabby chic style in decouapge. It’s a pity I did not have the crackle polish for it though. The difficulty with these trays is that the plastic is “slipery” so to say and the paint easily falls off of it. You may rub it with the sand paper first. I repainted the trays in white using acrylic paint. Then I decoupaged them and covered with transparent polish. 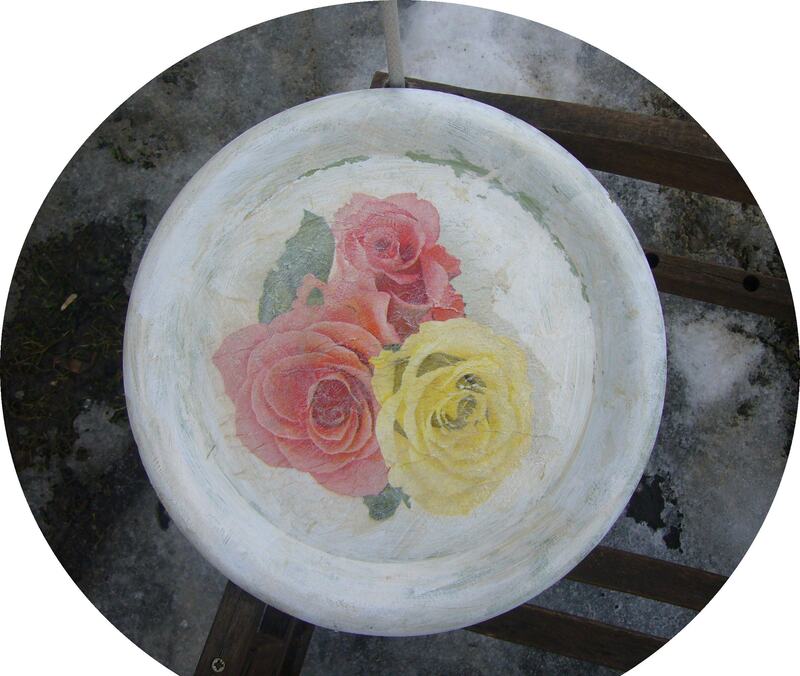 The rose tray, I did not like to leave it just white, so I dippied a napkin in some coffee and rubbed in onto the tray to make it look a bit old and shabby. It’s a small and old tile about 2 by 4 inches. It was a white tile, so I did not paint it and just decoupaged it with the napkin. Then I covered it with two types of polish: the transparent and pearl ones. Few weeks ago I bought this organic rope in the store. I fell in love with it the moment I saw it. I have already used it in many crafts. But I love this one. I just used hot glue gun to glue the rope around the tile and make a handle over it. So, now I can hang it on the wall as a small picture, or I can glue a recipe onto it or use it as a picture frame. I have made 3 of such tiles and gave two of them away putting on the printed Bible verses. They do make nice little and very inexpensive gifts. It’s a nice way to go green with these decoupage ideas. I hope you enjoy them, pin them and share them on Facebook or Twitter. This entry was posted in Crafting Tutorials, Decoupage ideas, Go green and tagged busy moms, crafts, creative tips, creativity, decouapge on plastic, decoupage, decoupage how to, decoupage ideas, decoupage on tray, decoupage step by step, decoupage tips, decoupage tutorial, decoupaged and recycled tile, DIY, go green, green living, handmade, handmade gifts, handmade picture frame, home decor, paper crafts, upcycling, wall decor. Bookmark the permalink.